"In these pages, the Professor had walked beyond beaten paths, looking for truth in a place no one knows"
It occurred to me when I was compiling my review list in preparation for Women in Translation Month that I’d read all bar one of Yoko Ogawa’s books which were available to me in English translation – so now seemed as good a time as any to complete the set. It’s a paradoxical feeling: on the one hand, I’ve now read everything of Ogawa’s that I can, so I must have some kind of handle on her work; on the other, it’s only four volumes out of a much larger bibliography, so how can I be sure? 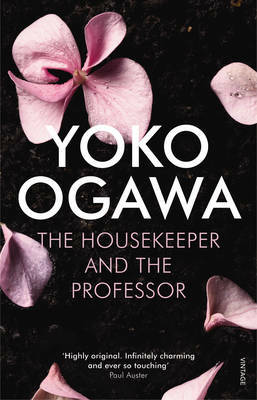 This is particularly relevant in the case of The Housekeeper and the Professor, because it’s a little different from Ogawa’s other books that I’ve read – the intense focus on a distinctive relationship is still there, but it’s noticeably less dark. There’s still a sting to it, but the overriding tone is wistful. I believe from what I’ve heard that it’s not typical of Ogawa’s work as a whole, but I say that with a degree of uncertainty. Anyway, our narrator is a housekeeper who goes to work in 1992 for a retired professor of mathematics (neither character is named). After being injured in a car accident, the Professor remembers nothing from before 1975, and his short-term memory lasts only eighty minutes – so, each time the Housekeeper arrives, it is their first meeting as far as he’s concerned. But the pair bond (albeit one-sidedly) over maths: it is the Professor’s world, literally and figuratively; and the Housekeeper becomes able to understand more because the Professor will happily explain concepts to her repeatedly (though for him, of course, it’s always the first time he’s done so). So the Professor’s worldview comes to influence the Housekeeper’s: she is inspired to do her own investigations into prime numbers, and even refers to her son solely by the Professor’s nickname for him, Root (derived from the flat top of the boy’s head, which reminds the Professor of the square root symbol). It’s a sign of how far the Professor’s outlook comes to suffuse Ogawa’s novel that the little numerical questions he asks the Housekeeper as a greeting – ‘What’s your shoe size?’, for example – seem jarring when he blurts them out in another context (namely, in the barber’s chair). At that sort of moment, we see the Professor’s outbursts as the rest of the world sees them: the ravings of a confused old man; but when he’s with the Housekeeper, we understand that they are a part of his mental framework. Stability is a key theme running through The Housekeeper and the Professor: mathematics as an eternal truth against the vagaries of life; maths again as the Professor’s store of knowledge against his fleeting memory; this particular job, these circumstances, as something the Housekeeper wishes to remain in. The melancholy truth, of course, is that the characters’ situation cannot last forever; but hope remains, because the numbers will go on. My other blog posts on Yoko Ogawa. An essay on Ogawa’s work in the LA Review of Books, by Robert Anthony Siegel. It’s funny, because The Housekeeper and the Professor was the first of Ogawa’s books I was exposed to. It seemed like every literary book blog was reviewing it, and she wasn’t anywhere on the radar of the translated literary world. And then somehow in the past two years it’s completely flipped, with readers getting to this one last and starting with the darker stories first (and with the shift returning to translated lit). I’ve still only read Revenge, but I just bought this last week and hope to get to in the next few months. I think it’ll be a really interesting contrast. I read this one first, then Hotel Iris which was quite different. I’d totally agree with the overriding tone being ‘wistful’. I liked it a lot – and I thought that the mathematics was worked into the novel beautifully. One of these days i will read one of her books……. I can’t wait to read this one, I read Revenge and promptly bought everything she had written. I then read Hotel Iris, which was so, so different, but I plan on reading this one next.